At a time when the development promise is increasingly in question, with dwindling social gains, the vision of modernity is losing its legitimacy and coherence. This moment is observable through the lens of critical struggles of those who experience disempowerment, displacement and development contradictions. 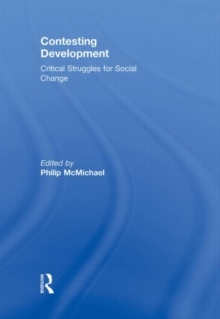 In this book, case studies serve as an effective means of teaching key concepts and theories in the sociology of development. This collection of cases, all original, never previously published and with framing essays by Phillip McMichael, has been written with this purpose in mind. An important additional feature is that the book as a whole reveals the limiting assumptions of development and suggests alternate conditions of possibility for social existence in the world today. In that sense, the book pushes the boundaries of "thinking about development" and makes an important theoretical contribution to the literature.